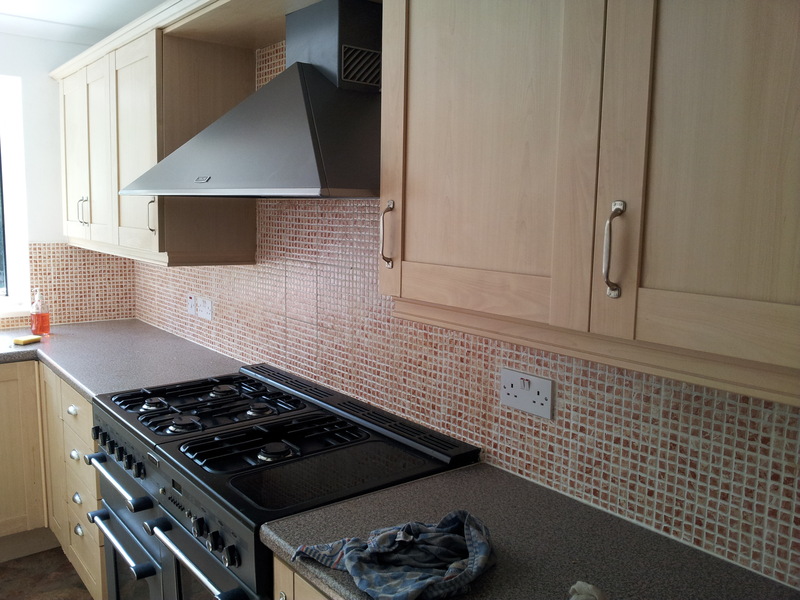 Kitchens – new doors or new kitchen? One of the reasons I started this blog was to provide information from my own experience in transforming my house. I want to write the posts I wished were out there when I have been trying to make some tough decisions regarding what to do to get my house how I would like it. Loathe the current kitchen? – check! Take kitchens for example. When we moved into our current house, 18 months ago, I hated the kitchen. 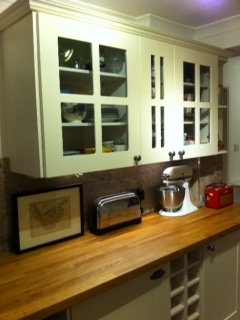 As luck would have it, this kitchen was the same style of kitchen that I had waited patiently (5 years!) to rip out and replace at my old house. The total for that new kitchen and associated plastering, electrics etc came to 9k for the old house and we certainly didn’t have that to spend in the new house (and the new house kitchen is larger – yikes!). Can’t justify/afford a new one? – check! Even more annoying was that all the units were in the right place and well installed and all the appliances were in the right place- I was actually looking for water damage at one point to justify gutting the kitchen! Having said that I don’t actually like the idea of just binning all those units and shelling out for the same thing again – seems like such a waste when you could be spending that money on shoes. 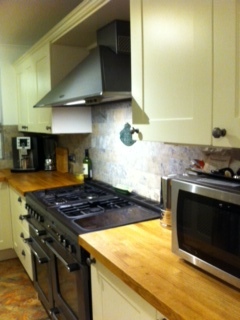 Health Warning: This photo shows the kitchen painted white to protect your eyes. It was actually oranger than this! The walls were orange! All the better to bring out the salmon orange tint to the fake beech wood cabinets! We endlessly debated whether to rip it out and start again or change the doors (but what about all the extra bits that would need to match – end panels etc?) and we couldn’t find any friends or family who had done it. Loads of people had asked about this on Mumsnet (some consensus that the finish wouldn’t be good enough) and other DIY forums such as Screwfix (kitchen installers generally against and not interested in the piece meal nature of the work) and Moneysaving Expert lots of discussion, but no great before or after photos or the kind of case studies I was looking for. It was only when Peter our fire place fitter and a competent tradesperson all round said he did his own kitchen and it’s not hard, I thought maybe we can do this! Condition – are all the carcasses (the boxes you attach the doors to, funny word that I would call them cabinets myself) in good condition? Yes – The foil covering on our cabinet doors was horribly chipped and warped from the steam of the kitchen, but the carcasess were still good. 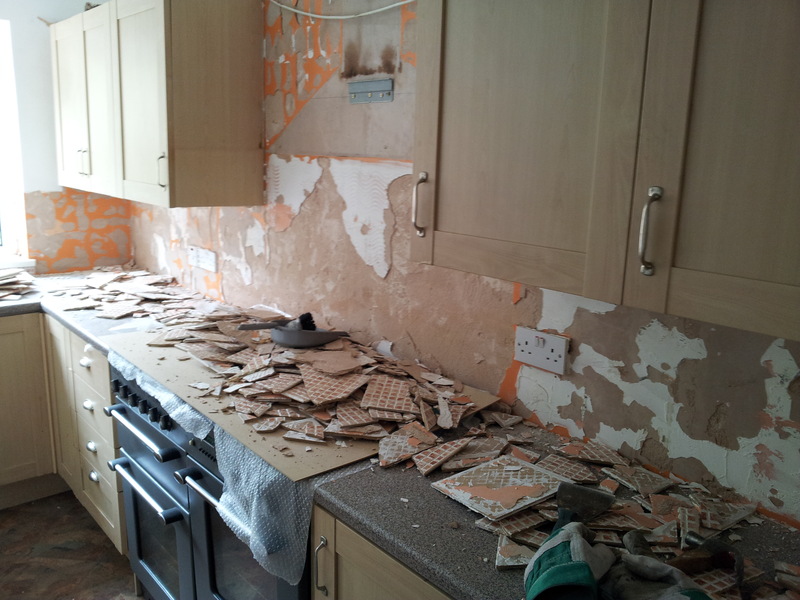 Changes – What can you not live with in this kitchen? What has to change? What can you actually hear mocking you when you walk in psst hey it’s us the tiles, yes we’re still here, we are fake ceramic, fake mosaic and virtually unclean able despite 5 bottles of Mr Muscle! We defy you to remove us! Can you make the changes you want to make to your kitchen through keeping the carcasses? 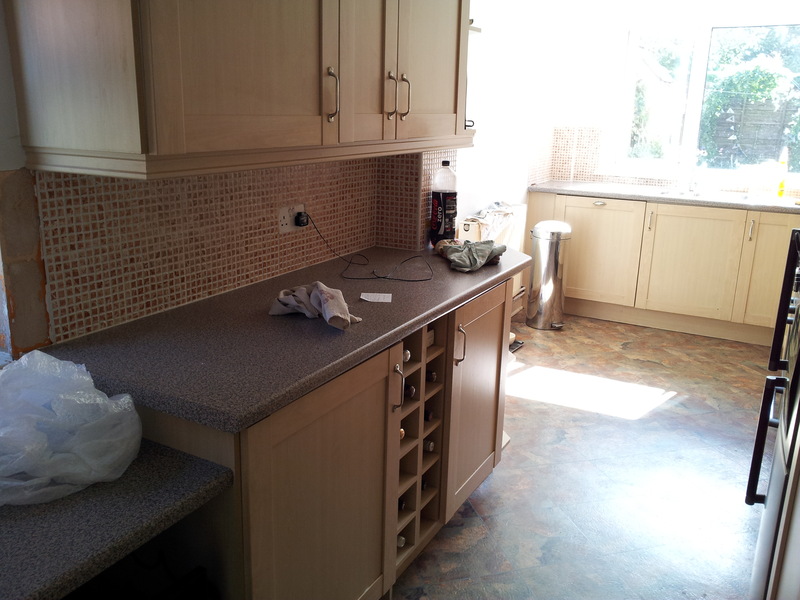 In this instance the tile, worktop (fake grey granite) and metal sink all had to go, but nothing electrical needed sorting or moving other than bringing the sockets forward as part of the re-tiling. Budget – What do you want or have to spend? 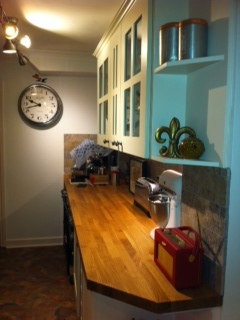 For us we hated the current kitchen, but for a number of reasons we did not want to spend a lot of money. For example in 5 years time we might consider knocking through into the conservatory for a kitchen diner or we could be in a different house altogether! We set our total budget at 2k and we planned to do as much of the the work as we could ourselves. Handy boyfriend was up for knocking the tiles off the walls (hurrah! ), prying up the old window sill boards, removing and reinstalling the cooker hood, painting the end panels and fixed shelves and swapping the cabinet doors and drawer fronts. We got our builder in to do the wooden worktops, re-tiling and moved the electrical outlet boxes forward so they were flush with the new thicker tile. And approximately 3 months later the end results! This entry was posted on January 12, 2014 by The Sourcerist in Projects and tagged kitchen doors, zero to hero.